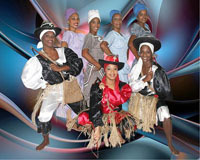 Obini Bata is the first all female folkloric drumming ensemble in Cuba. Obini is the Yoruban word for Woman. Bata drumming is the oldest drum tradition of Cuba. In Cuba the Bata are traditionally played only by men, but Obini Bata have challenged the taboo by becoming the first all-female bata drumming ensemble in Cuba. In addition to playing Bata, all members of the group play a variety of Cuban drums and percussion, as well as singing and dancing.  Top International Festival Cuba (Italy).  International Folklore Festival (France).  International Theater Festival (Spain).  Delegation of Cuban Art.